The one hour downloadable preview from yahoo games just wasn't enough... we thought we'd easily find the crack over the net (just like part 1) but we couldn't find any... must be because the game's still relatively new... i was so frustrated and i kept on pestering jon to search the net and annoyed him to the point of getting me the game... heheh... hey, it was mother's day after all, and whether or not i am already eligible for a mother's day gift, i got the game i wanted... and now, i'm hooked!!! hihihi. ..And special thanks goes out to everyone who prayed for us, congratulated us and even gave sound advices and tips... you're all a blessing! I'm on a three-month leave from work. This was actually suggested by my mother in law and my mommy because at the start of the pregnancy, i had this frequent abdominal pain which, i've read from my pregnancy books, were danger signs. It was scary... but luckily, after a couple of weeks of complete rest, the pain finally disappeared. So now, i'm on vacation but sadly, not enjoying it to the fullest... well, these pregnancy symptoms sometimes gets the better of me and leaves me feeling miserable... :( and can anyone take this summer heat??? arrrghhhh!!! Jon's 27th birthday. No surprises this time. Yep, too lazy. heheh! Jon n I stayed at Astoria Plaza in Ortigas for 3d2n (the first night was another gift) and had a very relaxing time. Buhay-baboy was a more appropriate term. We came back home Thursday afternoon and met up with Aion and Yna for Visita Iglesia that evening. We completed the 14 stations of the cross but only got to visit 7 churches around Manila (we were done at past 12 midnight already). For the past two or three years, Jon and i were not able to do this coz we were always out-of-town so this was a welcome change... and yes, the visita merienda was delish... ryt, guys? ;) bwahahaha! ...i'll be a matron of honor at my sister's wedding on july 15. - we had measurement taking last apr 23 and of course i had to stress that i'll be gaining weight for sure so my dress should better have room for major adjustments! ...fun party with my pamangkins! I was 5 days delayed. And so i asked to have a pregnancy test and thank God!!! 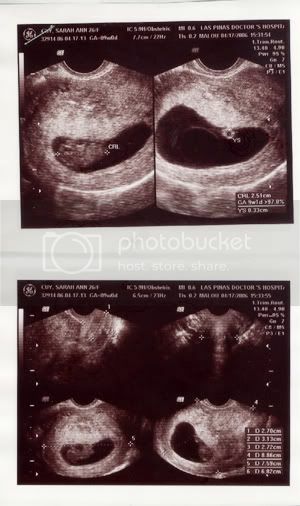 it confirmed that i am pregnant and i was ecstatic!!! Of course I didn't tell Jon right away... even if i wanted to. I wanted to see the look on his face when i finally tell him. Besides, i already made him believe that i already had my period while there in Cebu. 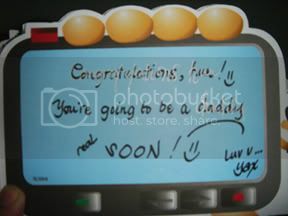 U see, he was keeping track of my cycle and my first day, supposedly, fell on the day i was to leave for Cebu (Sunday). He asked me Monday night. I didn't respond. He just assumed. I didn't correct him.., instead i made use of my acting skills all throughout. That way, even if i did have my period, he wouldn't be disappointed again. And this time, i was happy that i will NOT anymore.. Seeing Jon again at the airport made me want to blurt out the surprise then and there... but i tried my best to contain myself a little longer until we were home. Instead, we had dinner at Plato Platina to "celebrate" (together again eh... heheh). There were times I just couldn't help but smile to myself and when he notices this and asks me, I just make up some silly excuse which of course, he believes... He really doesn't even have a tiny bit of a clue... hihihi. But let me just describe it to u... First, he was laughing and smiling, and then, he was staring at the papers in front of him, teary eyed, in shock and disbelief... and then afterwards, he was jumping and acting like crazy!!! "Magiging tatay na ko!!!" Red Box with ofcmates to celebrate Dionne's bday. Jon, Lu, Jera, Bon n I had a sumptuous dinner at ___ before heading to our room at Red Box where we sang and danced all our stress away! Met our boys afterwards of course to take us home... hihihi. FSI Bowling games. I'm glad i chose to join these games coz i needed a break from all the work re interfaith. But despite the practice i've had with Yna the other week, i still sucked big time. heheh. I had fun for a while but had to go back to the ofc for more OT work in time for our flight that Sun morning... oh well. it has been a month-looong blogging hiatus for me... and i'm glad to be back! Work has been hell to say the least.. OTs were alien to me before but these past couple of weeks found me slaving away at the office til 10 pm and even a Saturday OT! All these because of the Interfaith Dialogue held in Shangri-La Mactan, Cebu last week which was participated by almost 200 delegates from 15 countries in the Asia Pacific. I'm just so glad it's over... and i'm also mighty proud of the excellent work we've done there. I was pretty miserable on my first two days (Sun-Mon) in Cebu because i was missing Jon terribly and i was tired all the time. Non-stop work, skipped meals, work til one a.m, lack of sleep... Luckily, on the third night, we got off from work a little earlier that usual and went back to our suite in Hilton. While 2 of my officemates decided to have dinner outside, i opted to just enjoy the time alone and ordered room service, plopped myself on the sofa, and watched American Idol on tv. I had enough sleep afterwards which accounted for the good mood i felt the next day. That Wednesday night, we tried the Sutukil and saw the Mactan Shrine beside it. Thursday, the last day of the conference... we were in panic mode again because of things to wrap up and handouts and cds to produce... two hours before the conference culminates, all hell broke loose... i was having an upset stomach and together with my officemate who was also experiencing the same thing, we were brought to the nearest hospital for immediate treatment. Although it was nothing serious, we had to wait for almost 3 hours for the result and by the time we got back to Shang, some of the team members were already packing our things at the secretariat. A blessing in disguise??? hahah. To celebrate the success of the conference we ate buffet dinner by the beach at Shang but since my stomach was still acting up, i didn't get to enjoy it that much... I decided to go home early to rest at our beauiful suite. ...and then he told me that his original plan was to go up to my office and deliver the flowers right to my table but he just couldn't find a parking space (he went around the area a few times already)... and that we really weren't supposed to have lunch-out talaga... haha! We just drove thru Jollibee Macapagal and ate lunch inside the van... that's when i had a clue that he was taking me out to something fancy that night. When i got back to the office (bringing with me my flowers, of course), i got totally swamped with work and meetings that before i knew it, it was 6pm already... i even had to excuse myself on that last meeting just so i could have a quick change of clothes and made up my face in a hurry. 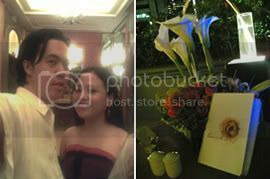 As soon as i stepped into the romantic ambience of the patio garden of Shangri-La Makati, i fell in love all over again. We were led to a corner table which had a beautiful centerpiece of candles, roses and calla lillies.., beside us a huge glass waterfall. Stars were few that night, but the full moon just above some of the buildings was a perfect finishing touch. We had a gastronomic four-course dinner complemented by red wine and there was even a live band singing love songs which made the enchanted evening more memorable. hey, hey, hey! :) ...i'm back!!! 'ope everyone had a nice V-day celeb! ..coz this hopeless romantic sure did... :) ...still pretty much hung over about the whole thing, actually... happy happy joy joy!! We arrived at Tagbilaran airport early Thursday morning and even the downcast skies and the slight drizzle didn't dampen our spirits. We easily saw our chauffeur and immediately took us to the resort where we are staying for 3 days (Panglao Island Nature Resort). The place was really beeyootiful!!! Especially our bungalow with jacuzzi... i would have to say that this really beats our Bora accommodation last year (Fridays - except for the four-poster bed... heheh). Really, it was the ideal honeymoon place (which is precisely why we chose this over the other resorts in Panglao)! Since there was no night life in the place, we were ready for bed as early as 10pm... and we had enough time for more relaxing... Jon watched TV while I read the book "Memoirs of a Geisha"..
We went back to the resort to change and drop off our things and took a dip in the infinity pool... it was really getting cold already so we made our way back to our jacuzzi. ;) We ordered room service and ate dinner inside our room. We had an early big breakfast the following day and went straight to the beach and the man-made islet. More picture taking, swimming - which we continued in the infinity pool and our jacuzzi before we got ready for check-out. woohoo!!! finally!!! the much-awaited transfer of my boss to another department materialized early this week and i am finally out of her claws! bwahahaha! i am freeeee!!! But then again... she's outta here... and the Dialogue will take place in more than a month pa... still more than enough reason to celebrate!!! yahooo! and celebrate, i did! =D I took a much-needed rest from work for two whole days. I read a book (Digital Fortress by Dan Brown), surfed the net, watched videos, ate, and slept. Jon and I also went to Tiendesitas at Ortigas Wednesday afternoon to check out this new shopping place i've been hearing about... only to get a little disappointed. oh well... the *toot* more than made up for it naman... bwarharharhar!! i was still so pissed so i separated "us"
so anyway, this is "us" moments later... nyahahaha! my mom's getting married again!